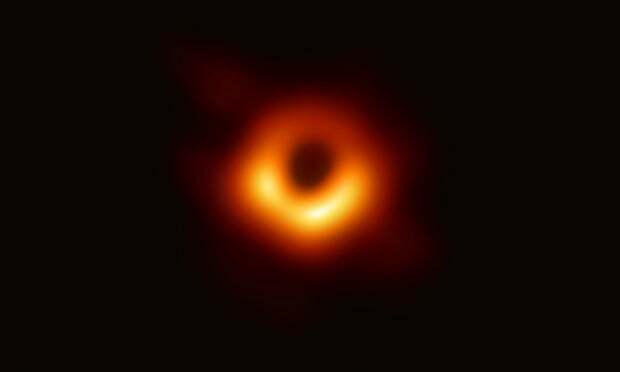 The image gives the first direct glimpse of a black holes accretion disc, a fuzzy doughnut-shaped ring of gas and dust that steadily “feeds” the monster within. The rendering below from the journal Nature explains how we see a black hole. The images – a glowing, ring-like structure – show the supermassive black hole at the centre of the galaxy M87, which is around 16 megaparsecs (55 million light years) away and 6.5 billion times the mass of the Sun. They reveal, in greater detail than ever before, the event horizon – the surface beyond which gravity is so strong that nothing that crosses it, even light, can ever climb back out. A black hole’s event horizon should appear five times larger than it is, because the hole warps the surrounding space and bends the paths of light. The effect, discovered by physicist James Bardeen at the University of Washington in Seattle in 1973, is similar to the way that a spoon looks larger when dipped in a glass of water. Moreover, Bardeen showed that the black hole would cast an even larger ‘shadow’. This is because within a certain distance of the event horizon, most light rays bend so much that they effectively orbit the black hole. This three-minute video explains how the image was captured using eight telescopes spread around the globe. Here’s a nice video that gives a good picture of what happens with the bent light. Apparently there are “black hole denialists” who claim that black holes haven’t been proven to exist; which is interesting because they don’t have another theory for how an equivalent mass in the same space would behave. People are even stranger to me than black holes. Thanks, ahcuah, that was a good tutorial! Seeing predictions I grew up with turning into actual photographs is so cool.